This infographic, found on the blog LEARNIST is a great way to show what an adjective is. My parents spoke with proper grammar, and taught me to do the same. Several times, I have been complimented on my grammar. But in fact, beyond a noun and a verb, I could not tell you the names of the parts of speech. A student will never be tested in the middle of a conversation on the parts of speech. But, with a growing number of students being influenced by music and social media, there are a growing number who are speaking with poor grammar. For this reason, it is becoming increasingly important to teach your students proper grammar, how to use it, and even the names of the parts of speech in order to use them properly. 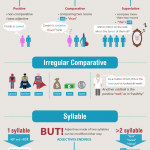 This blog, posted by LEARNIST, is a great overview of the adjective. Adjectives are a great way to bring a sentence to life, and are important to express oneself fully. Students main moan and groan when you bring out the dreaded grammar book, but they use these on a day to day basis. Here is a challenge you can give your students. Grammar is important in order to seem intelligent to those they would want to impress. As long as students use proper grammar in your classroom, they do not have to do grammar work. But whenever you hear improper grammar being used, whip out a short activity that teaches them about the proper way to speak in the way they spoke improperly. This would be difficult to do with a large classroom, but it will encourage your students to practice proper grammar.